Charles Lutwidge Dodgson (pron. 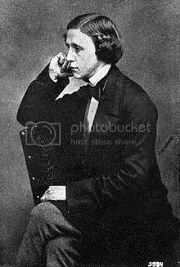 : /ˈtʃɑrlz ˈlʌtwɪdʒ ˈdɒdʒsən/ charlz lut-wij doj-sən; 27 January 1832 – 14 January 1898), better known by the pen name Lewis Carroll (/ˈkærəl/ karr-əl), was an English writer, mathematician, logician, Anglican deacon and photographer. His most famous writings are Alice's Adventures in Wonderland and its sequel Through the Looking-Glass, as well as the poems "The Hunting of the Snark" and "Jabberwocky", all examples of the genre of literary nonsense. He is noted for his facility at word play, logic, and fantasy, and there are societies in many parts of the world (including the United Kingdom, Japan, the United States, and New Zealand) dedicated to the enjoyment and promotion of his works and the investigation of his life.